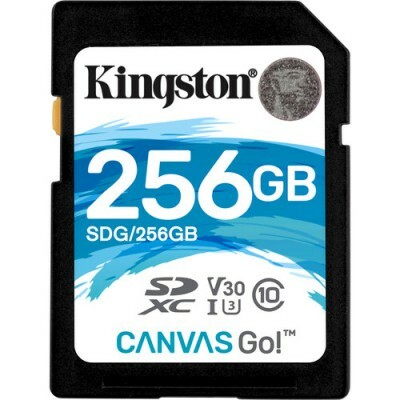 Kingstonâ€™s Canvas Go!â„¢ SD card is designed to be on-the-go, making it ideal for filming lifeâ€™s adventures in 1080p or even 4K. This card is tested to be durable1, so you can be confident that your memories will be safe when documenting the next journey on your DSLR, drone or other SD-card-compatible action camera. Itâ€™s available in multiple capacities up to 512GB2, to provide plenty of space to capture your next big trip. - Long buffering â€“ when you press the shutter and the camera takes the shot but then it freezes until the data is fully written to the card. - Corrupted video â€“ video cameras might produce corrupted video files if the card speed is too slow or the camera may downgrade the video to match the speed of the card. This could turn full 1080p HD video into a video with much lower resolution. - Shortened clips â€“ when a camera has a higher writing speed than the Flash card, the camera will pause and the video clip will abruptly end once the speed limit of the card is reached. - Burst shooting â€“ many cameras have a burst mode feature where one press produces a repeated series of photographs; this allows users to capture fast-moving events or subjects like pets and children. If the card writing speed is too slow, burst mode setting will not work.